Notes: The Dirty 30 was a 30-mile bike race that started at noon from the Midtown FreeWheel Bicycle. 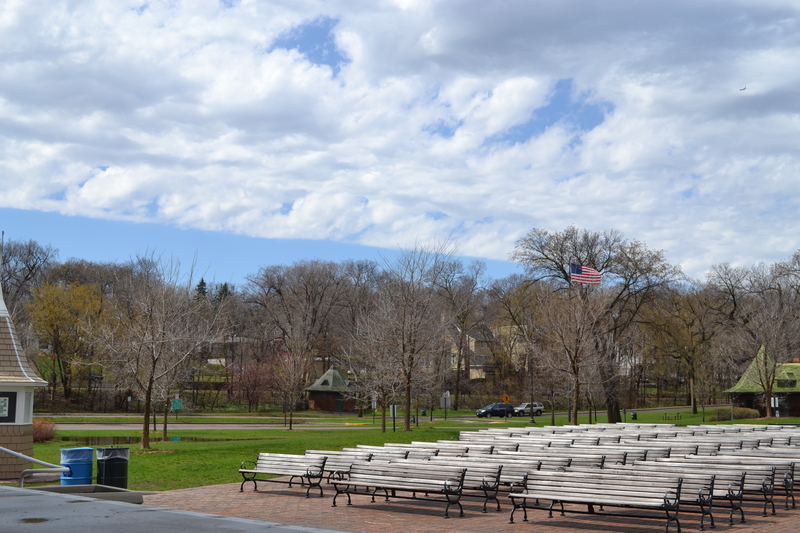 One of the stops that racers had to make was at the Lake Harriet Bandshell, where they did a time trial around the lake. 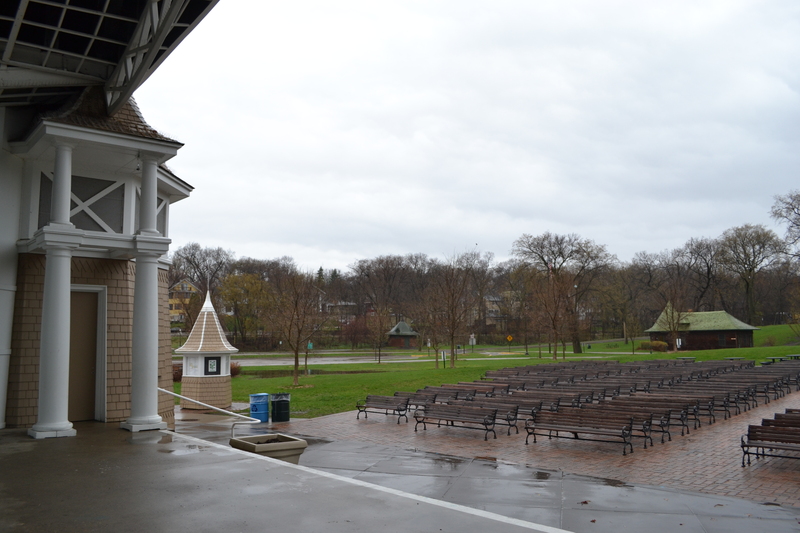 I rode from my house to the bandshell in a pretty steady rain and was cold and waterlogged when I arrived at 12:45. Happily, I had thought ahead and brought a thermos full of steaming hot coffee, a towel and a pair of warm pants to put on over my bike shorts. After all of the racers went through our station me and the guy who was recording the cyclists’s times rode downtown to Grumpy’s for the awards ceremonies, aka the handing out of the cash prizes and swag. I rode back home from Grumpys along the the central corridor trail and then up the Greenway, where I was up against a very strong headwind. The ride home from Grumpys. 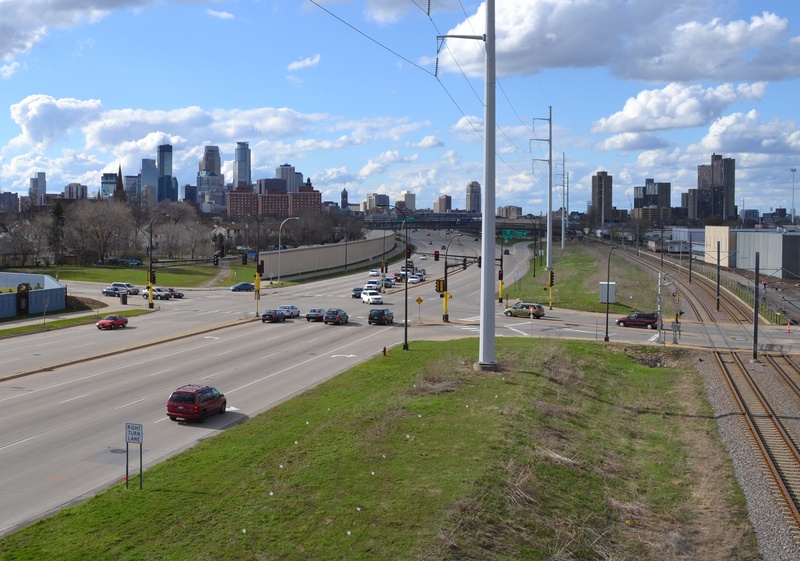 View of the city from the Martin Olav Sabo Bridge over Hiawatha Ave.
We did two rides today! The Hubby took this picture of me in front of our bike lights. 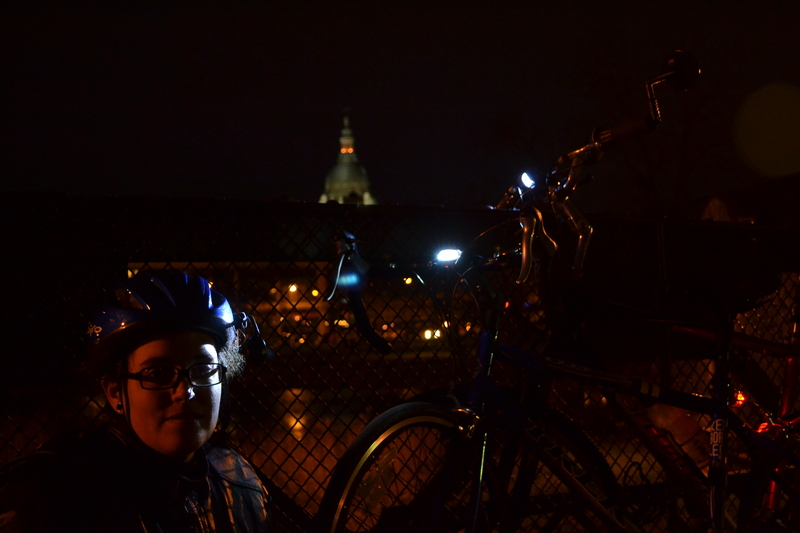 We’re on the bridge over the Loring Park lake, and the basilica and Loring shops are visible in the background. Total Miles: 5.5 today! Not bad for a work night. 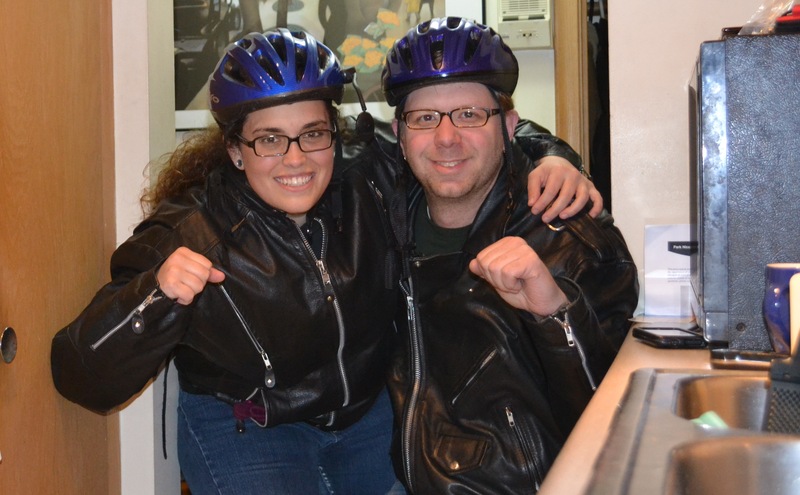 Notes: We were digging through the coat closet, trying to figure out which coat was best suited for our crazy Minnesota spring weather and decided to have a leather motorcycle jacket ride. 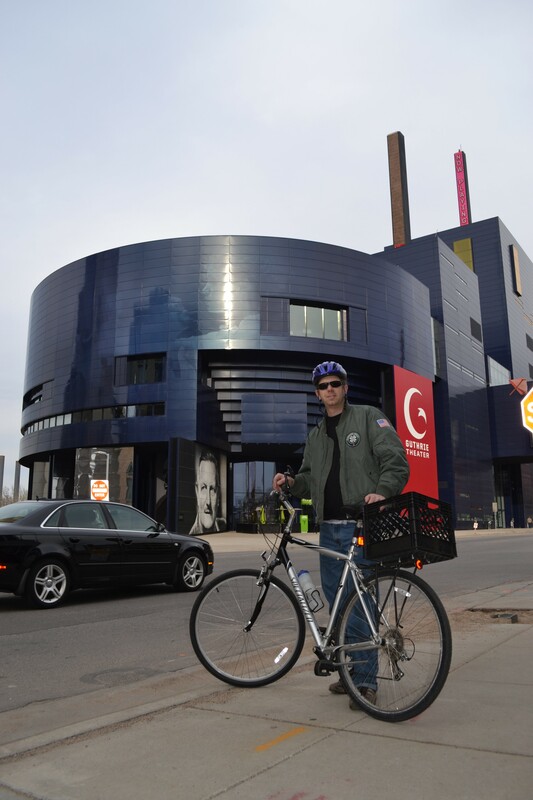 #sololocal description from 30DaysofBiking: Every Wednesday in April is the Solo Local ride, where you venture off on your own to your favorite local establishment—by bike! 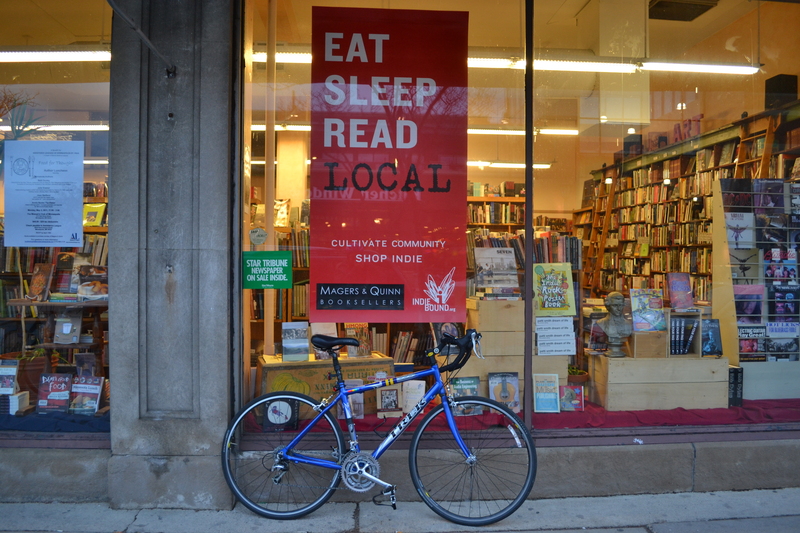 This week, route your way to your favorite local book store. Huzzah for local business! 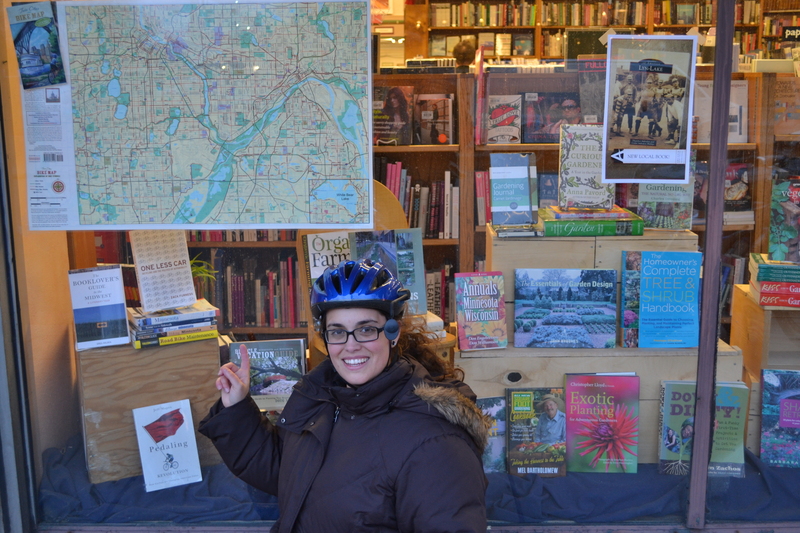 Look – books on biking and a Twin Cities bike trails map right in the front window display! Dining Out for Life Minnesota is tomorrow – Thursday, April 28th. 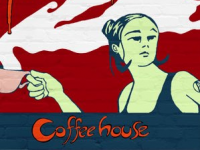 Go out to any one of a gazillion and ten participating restaurants, and the restaurant donates a portion of your food bill to The Aliveness Project, a local nonprofit agency which each year serves one out of four people living with HIV/AIDS in Minnesota. The Aliveness Project offers an on-site hot meals program, food shelf, integrative therapies, case management, holiday baskets, HIV educational services. 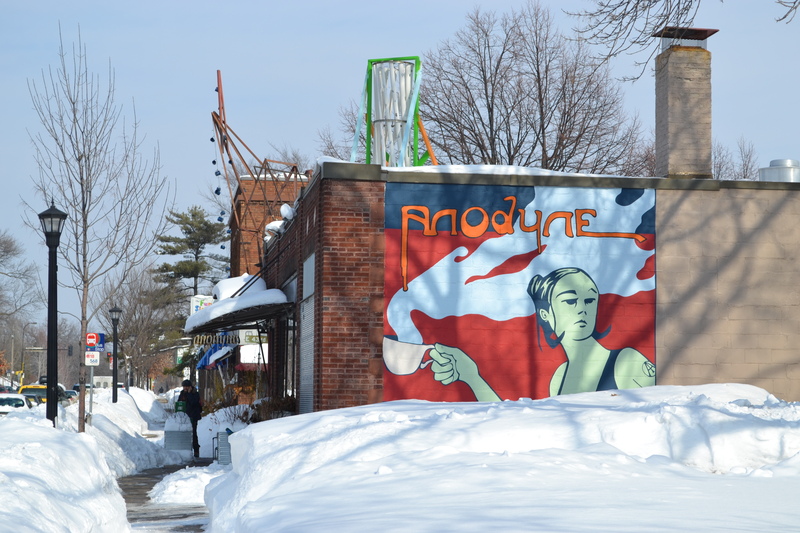 I’m getting up early to have breakfast at Anodyne Coffeehouse in South Minneapolis before going in to work. 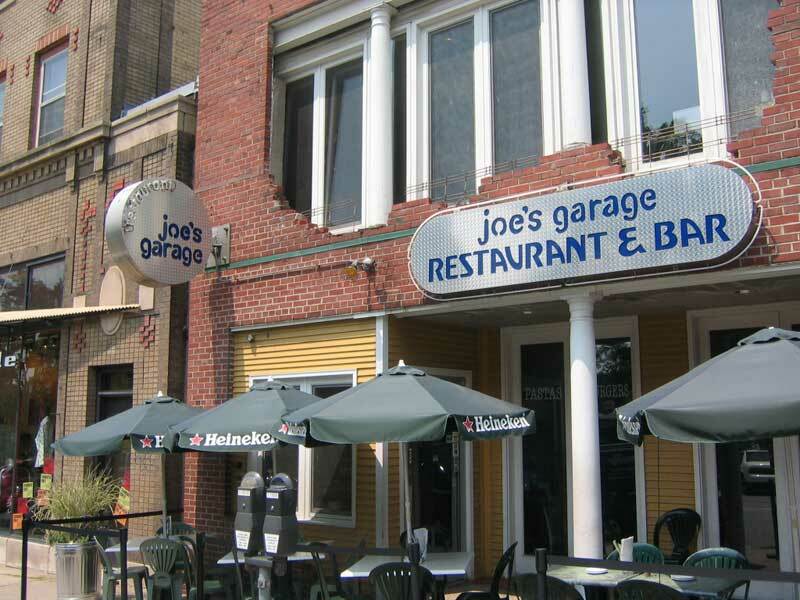 And for dinner I’m going to Joe’s Garage in Loring Park with a bunch of friends. There’s an entire list of restaurants throughout Minnesota that are participating in Dining Out for Life. This is almost as cool as the lego dissection! 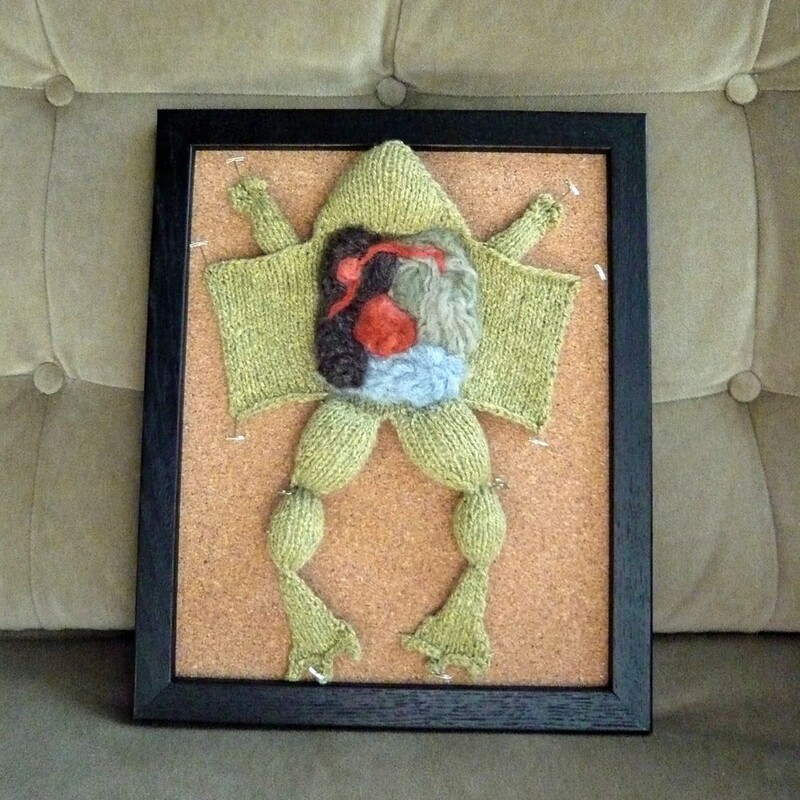 Wow your scientist friends and colleagues with the coolness of this piece of knitted art. The frog is hand knit from a silk/wool blend, and his little innards were needle-felted by hand out of 100% wool. He comes pinned into his black wood 8 x 10 inch frame, but he is not glued down, so you can take him out and cuddle him if you wish. This little guy was only $7.50! Sadly, it was sold out. But then, why wouldn’t it be? The most accurate answer to this CUP is “Acorn Squash”. 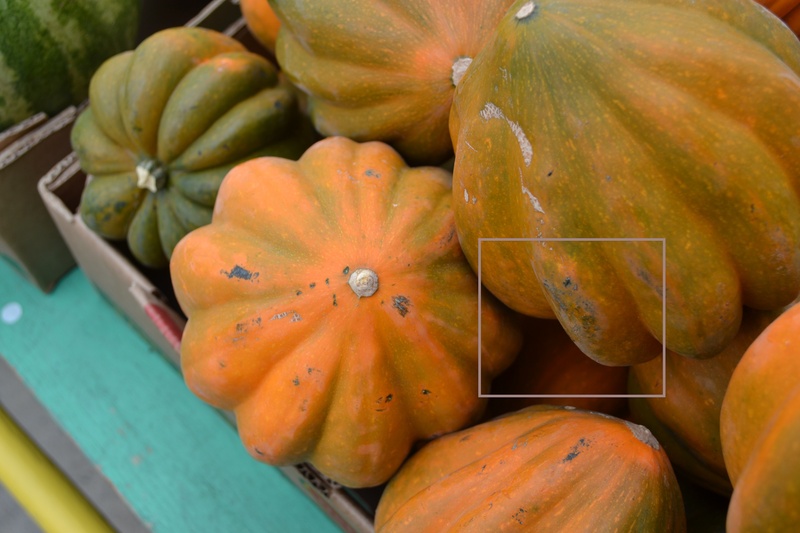 No one gets a full 100 points this week, but Carly was the first to guess “squash”. I awarded Carly 75 points and the prize of Closest To Being the CUP Winner This Time Around (that’s CTBTCWTTA, for those of you who are abbreviation-minded). Jeremy (via Tina) gets 50 points for first guessing “Acorn Squash”, plus 5 points for making me gag while eating lunch by talking about Grandmothers, Legs and Tan Lines in the comments. Noelle (graysintheshade), Vicki, Ben, Jude, Erin B. and Steve D. (Facebook entry) all get 20 points for guessing some sort of squash/gourd. Steve D. and Erin B. each get an extra 5 points for throwing their hats in the “acorn squash” ring. Cate and Becca Leah get 10 points for participating, but no extra points for their incorrect guesses. Becca Leah gets an extra 10 points for joining us as a new player. Welcome Becca Leah! That’s it this week, gang. I’ll update the CUP Winners page later tonight – a quick glance at the board shows that Jeremy is still in the lead, but he’s got a few contenders who are not far behind. Like I said in my last announcement, I’m going to try to start posting these every week, so expect a new CUP fairly soon. Thanks for playing, everyone. You make blogging even more fun than usual! 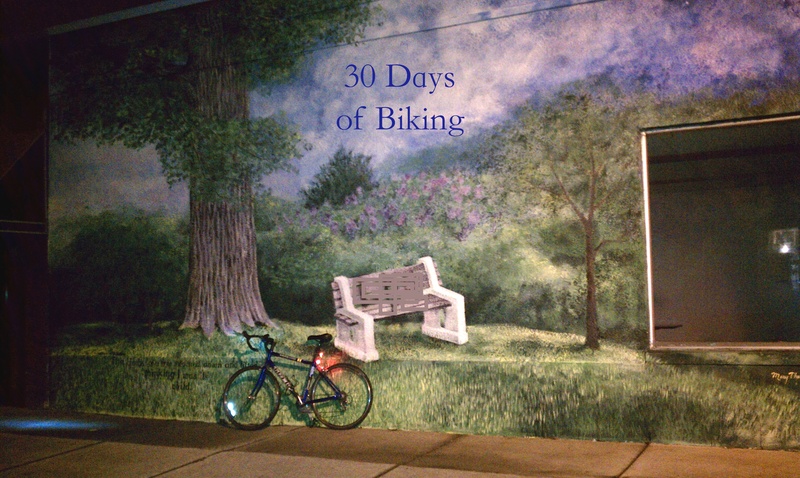 A quick night ride up Grand Avenue landed me in front of this painted mural at 38th and Grand Ave S. across from Victory’s 1959 Cafe, Peter Pan Cleaners and the Grand Bakery. 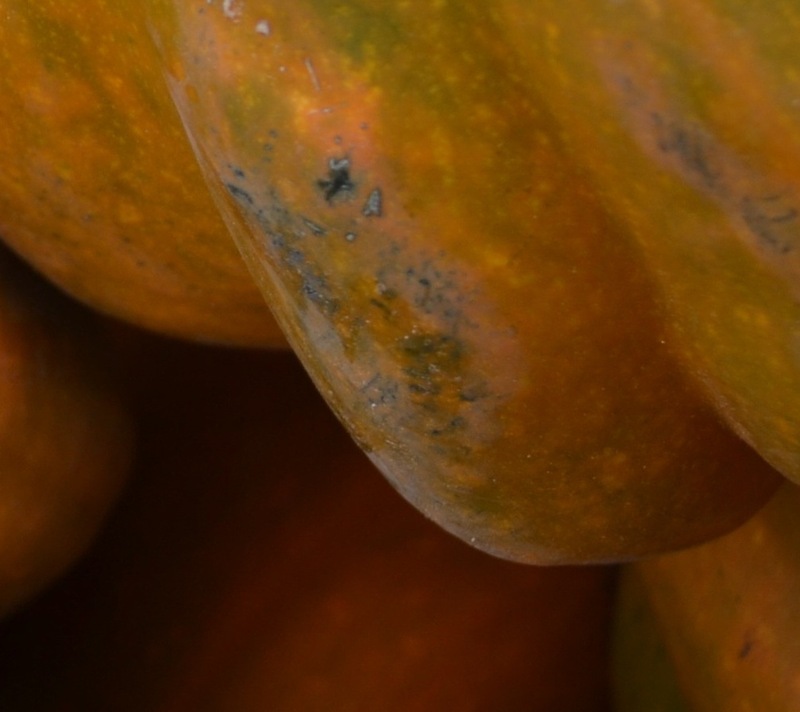 Identify the item in this photo and you’ll receive undying admiration from the Biodork CUP Contest participants. And that’s really about it. Maybe I’ll throw in some super fancy internet points. All guesses submitted via the comments or by Facebook will be accepted. The first person to guess correctly wins 100 internet points. I will award or deduct points for additional guesses based on a completely arbitrary and whimsical set of rules known only to myself. The first person to win 1000 points will be the grand winner of the CUP Contest, and the recipient of Uber-CUP Winner bragging rights and a pretty lame-o prize. The list of past winners and current rankings can be found on the CUP Winners page. 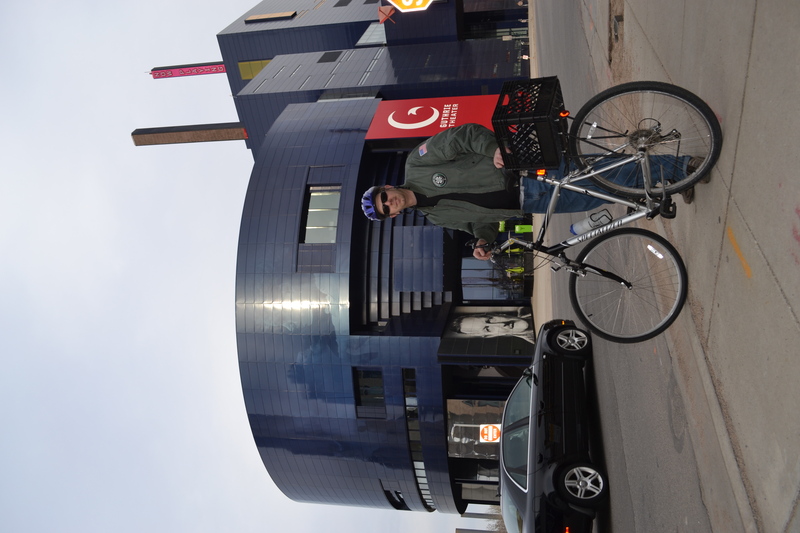 Why: Transportation – Guthrie Theater to see Jonathan Coulton with Paul and Storm, then back home later that night. 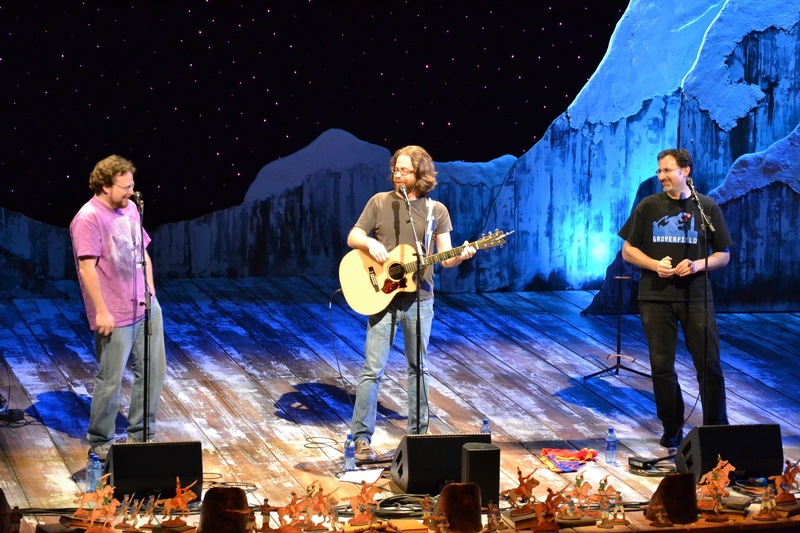 Jonathan Coulton (middle), with Paul and Storm at the Guthrie Theater, Minneapolis this evening. More on the concert later. Bed now.